What is “food writing” but writing with food as the protagonist? Or perhaps food is the pretext for writing about family, adventure travel, science or social history? That’s what we’ll be exploring at Gateway Community College in New Haven where I have been invited back to teach Food Writing starting in January 2016. The 15 week course, which will meet on Tuesday evenings starting January 26, covers the personal food essay, restaurant reviewing, recipe writing, food blogging and more. One again, we’ll use Dianne Jacobs’ terrific book Will Write for Food as our roadmap along with short pieces by a wide range of writers. Her just-released third edition of this book is packed with the kind of information experienced and inexperienced food writers will devour. We host guest speakers throughout the term. Layla Schlack, the executive editor of Fine Cooking Magazine came to speak to our group. A final project allows students to dig deeper into a subject they love. One student wrote about his experience as a stagaire at an Irish Pub where the chef cooks vegetarian meals. Another explored the writing styles of Connecticut’s most well known restaurant reviewers. We learned about Puerto Rican adobo and the perspicacity of one Jamaican cook who was asked to prepare the family meal one time too many. We experienced the sense of taste and smell in a fun experimental class. Here are three fun essays by members of the class who agreed to share their work. The class is open to Gateway Community College students and anyone who cares to join us. The only prerequisite is a willingness to write. I am grateful to my first group of students, who stayed with it for the entire semester despite the record breaking snow. And of course I’d be happy to answer questions or go into more detail. Please email me at pm@priscillamartel.com. Here is the Press Release from the school. It goes into more detail including course number and meeting times. 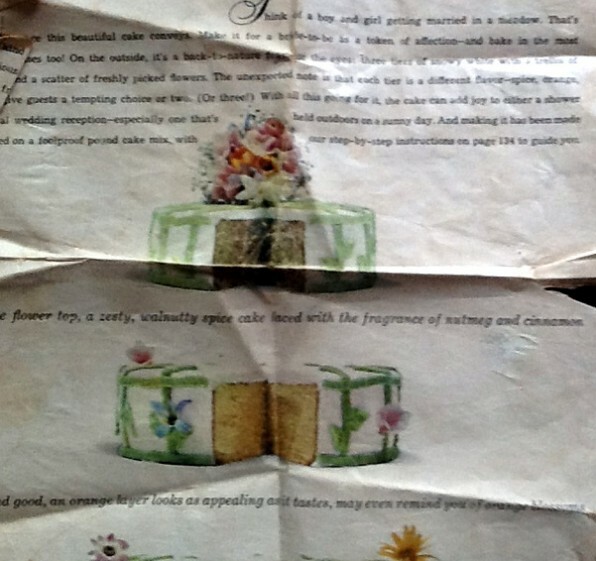 This photo of a page from Seventeen Magazine shows the shower cake that I made for my aunt’s wedding when I was in my teens. “Think of a boy or girl getting married in a meadow,” the copy reads. The only “boy” and “girl” involved with the wedding were my brother and me. My aunt married a bit late for the time, in her early 30’s I think, hardly a girl, as if anyone would use the word to describe a 21st century bride. Recipes have many tales to tell. And this soiled piece of paper could form the basis for any number of stories. There is the recipe itself, a forerunner of the kind of transformation Anne Bryn makes in her Cake Doctor cookbooks. The clever recipe involves flavoring Dromedary brand pound cake mix so that each layer varied- a spice layer for the top, an orange layer in the center and a generous chocolate layer on the bottom. The cake is frosted with white buttercream. You tint some of the frosting grassy green then pipe a trellis pattern over the top and sides of the cake. Strategically placed fresh flowers cover any botched piping. Dromedary pound cake mix is still available. It’s part of ACH Food’s portfolio of other stolid brands like Argo, Mazola, Karo and Durkee. I’m inspired to try it again to see if it triggers any taste memories. And to explore spice cake, ubiquitous when I was growing up, with cream cheese frosting. On Walmart’s web site, where a 12-pack sells for $30.07, one 50-year user of the product complained that the product has lost its special qualities. She laments her life without pound cake mix, another avenue of American packaged foods to explore. I also grew up with pound cake, Sara Lee the standard by which all others were judged at that time.